Path to Permaculture: Delvin's Story - Permaculture Institute Inc.
Making a life map, story or portfolio can be a profound way to ‘meet yourself’ as well as to introduce yourself to other people. By charting your ‘river of life’ you can glean important insights and identify patterns, both positive and negative, that can evolve the way you design your life ahead. At its core, permaculture is about observation and interaction, learning the skills to be able to take care of ourselves and the natural world around us. Everyone has an interesting story about when they ‘woke up’ to a deeper understanding to nature and the ethical calling to use their precious life energy in service to solutions. I grew up at the edge of Vancouver, one of Canada’s largest cities with beautiful mountains and ocean, but also the heroin capital of North America. The city is filled with grit and glamour and surrounded by rainforests, providing a dynamic context for my childhood. My dear mother was a green thumb and master gardener. She taught me an appreciation for the natural world. After high school I was unclear on how to proceed with life so I took a general studies approach based on my interests and passions: anthropology, humanities, archeology, literature, poetry, psychology and other arts related classes. To pay for school I started a gardening business. I had no idea how to garden, but I asked those who hired me to describe in detail what they wanted me to do. Gardening is not rocket science, and a lot can be learned from just doing it with some careful observation of the process and results. After university I still had no direction for my ‘career’ so took a post-BA degree through a participant driven and student-directed program at Simon Fraser University. During this time I was traveling internationally to festivals and conferences to do multi-media presentations on ‘future culture’ as well as curating galleries, making media and setting up workshop areas to bring more education into these edge events. I moved a few hours away from Vancouver to a beautiful tiny coastal rainforest village to deepen my relationship to nature. It was in my new home that the Permaculture Design Course came to me . A group of us gathered at a local farm called ‘Phytomphalos’ where we did a local course using the guidance of an online PDC program. Lance Wildwood directed the class and we worked through the curriculum in a brilliantly hands on way, despite the distance we had from Permaculture Visions in Australia who was offering the course. Permaculture Design immediately made perfect sense to me, it was all like a big aha moment. This illuminated my understanding of some challenges and paradoxes about society and gardening that I had been struggling with since I joined the workforce at 16. 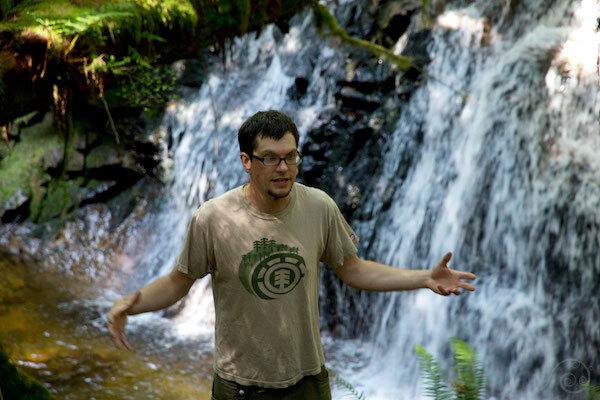 When the course finished, it felt clear permaculture would be part of my path. 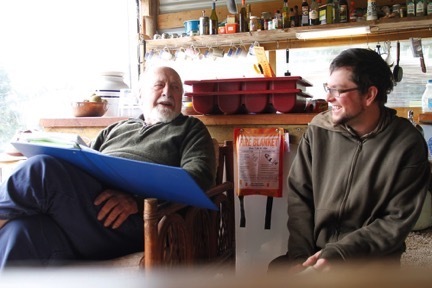 I began correspondence with Bill Mollison, the co-originator of permaculture who mentored me on a Diploma path as the next step. With my friend Ainsley Krone, and the support of Marilyn Magas who ran the local employment center, I managed to get a lot of money from the Canadian Federal Government to start a Youth Program which went into all the elementary schools in my bioregion to do permaculture education, build food gardens and recycling stations, hold full school assemblies and organize interactive, hands on experiences for the kids. We called our program ‘Eco-Tech’ and it ran for two years on grant funding. Participants were paid to take many resume boosting certifications including a PDC that I facilitated, while building community gardens and doing a number of meaningful service-oriented tasks in the bioregion. For this work I was awarded a Diploma in Permaculture. Wow! I was being acknowledged for something I would have done anyway. During this time I started to fall in love with permaculture education. Realizing that the mainstream education system had been weaponized to create consumers, I began to marvel at the design and delivery of the permaculture curriculum. When we lost governmental funding for our radical program, I got a job transforming the downtown of my little village into a permaculture site featuring plants with a history of use by Coastal First Peoples. David Holmgren told me to build a ‘Life Ship’ and so this property shares seeds, genetic material and practical education on over 400 species of cool climate hearty perennial plants with a history of use by Traditional Peoples. For the 15 years to follow I have traveled to learn with many of the permaculture pioneers at some of the best permaculture sites throughout Australia, England and North America. Taking many advanced courses and teacher trainings, I have slowly observed and mapped my own teaching practice and developed a comprehensive permaculture design certificate course along with a host of free open source learning and teaching materials. I did a five year Masters Degree under the mentorship of Bill Mollison and Patricia Michaels culminating in time with Bill at Tagari Farm in Tasmania. 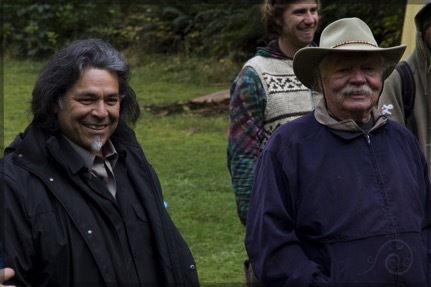 A new chapter in my permaculture life story opened up when I met Larry Santoyo and Scott Pittman at a teacher training in 2012. After two years of online mentorship from Larry Santoyo, I had finally met this amazing force of nature in a life changing course. Meeting these men fortified me for the task of sharing permaculture design and gave me the strength to choose permaculture as a life path. Now I mentor others through the Permaculture Institute Diploma program. I am still very much observing and mapping my garden, like my life, and integrating those observations into maps and designs using the permaculture toolkit. Writing a bit of your story may astound you when you discover what comes out of this profound process. Making a map of the past is the first step to making a design for the future. Bill Mollison said we need to become ‘Time Scouts’ for our lives and landscapes as well as the larger world into which we are woven. Do you have story about your life? Permaculture can help weave your story together to include a holistic map of your home or garden, as well as your work and education. A life map is a powerful way to explore who you are and discover your passions. My passion is education and I intend for this to be the first of a long series of blogs sharing insights, illuminations and free resources as part of my work with Permaculture Institute.